The most important thing to know about art supplies is that the materials you have are all you need to get started. 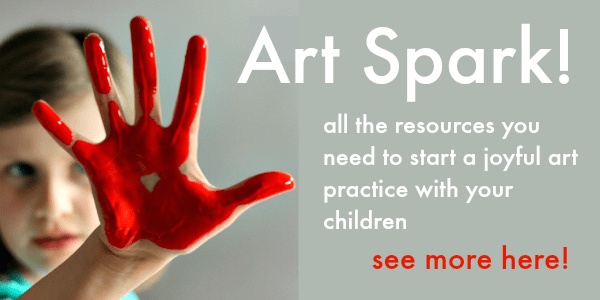 Although we would all love to have unlimited access to the contents of the art store, having just a few, affordable art supplies is no barrier to getting started. Start with what you have. 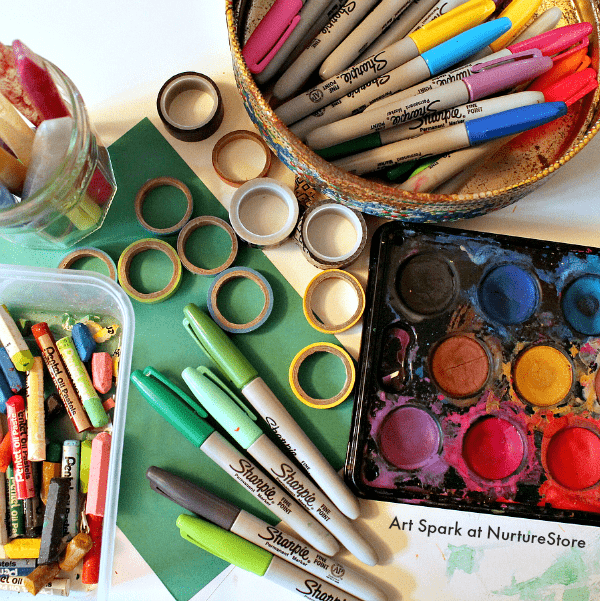 Later, in the A-Z of art supplies, you’ll find a big list of materials that can be used for art – many of which are natural materials you can gather freely or everyday items you can re-purpose for your art. There are a few key things you should aim for if you’re setting up a basic art kit. 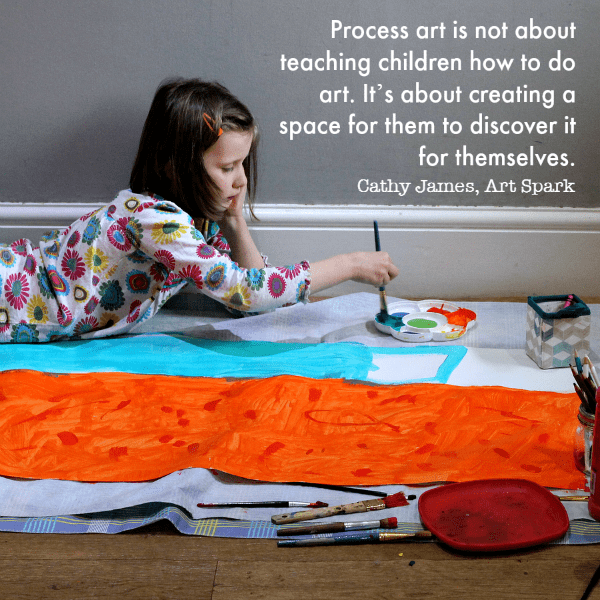 You’ll want something to create your art on, and paper is the usual go-to option here. It’s good to have a selection of different sizes and colors, but you don’t need every kind of paper possible. Aim for a few choices – picking from stacks of loose printer paper, big rolls of paper, sketch books, perhaps watercolor paper, and some thick card stock. I store most of our papers in a accordion file, with the papers arranged in the order of the rainbow. It stays permanently open so it’s easy for everyone to pull out the colors they want. Watercolor paints are our favorite, tempera/poster paints are good for general projects, and acrylic paint gives a bolder effect and is good for better coverage. A selection of pens and pencils is so inviting and is a good mess-free option that can be kept readily available for independent projects. A choice from colored pencils, wax crayons, oil pastels, (permanent) marker pens, sketching pencils, chalk, charcoal, fine-tipped black and white pens, or watercolor pencils is a great place to start. Child-sized scissors, stronger adult-sized scissors for cutting thicker paper and card, and craft knives are useful. 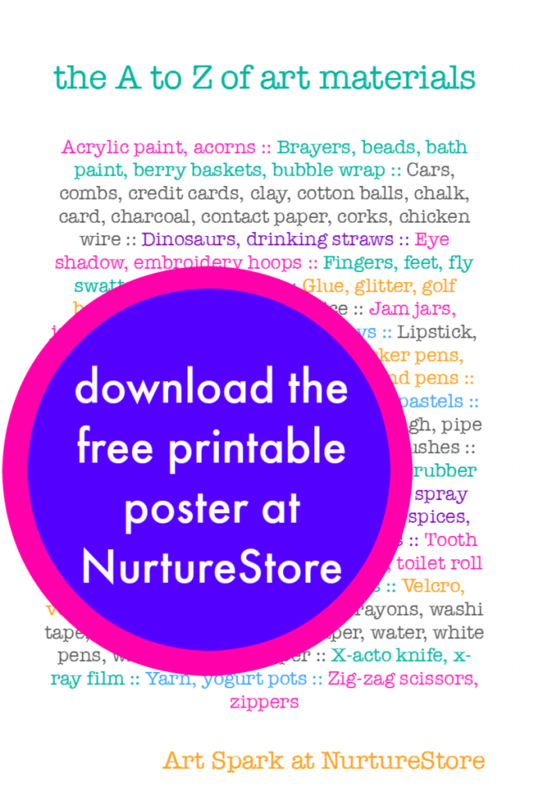 Glue sticks are great for very young children and relatively mess-free. White craft glue is good for sticking paper together, and for some of the process art techniques featured in my Art Spark book. A glue gun is effective if you need a stronger hold, and it’s a good piece of equipment for children to learn to use safely under your supervision. Glitter glue is a fun way to add extra sparkle to your creations. Often my children like to use tape for their projects, as it gives a quick fix with no waiting for glue to dry. Sticky tape in a weighted dispenser is easy to use. Paper tape such as decorators’ tape and washi tape is easy to tear, so no scissors are needed. These low-tack tapes are also useful for tape-resist art projects, as the tape can easily be removed from your art work. Here you can go to town, gathering all sorts of materials to add color, texture, and interest to your art projects. 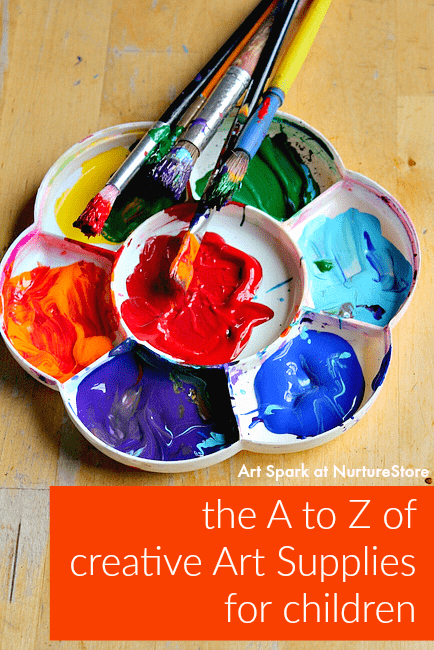 Take a look at the A-Z of art supplies list for ideas – you can print it at the bottom of this article. My girls’ favorites are always stickers and glitter glue. Think about how you can add interest and new direction to your supplies by considering color, texture, tools, media, and shapes. :: as a discussion prompt with your children. Which of the materials do they thing would be fun to try? 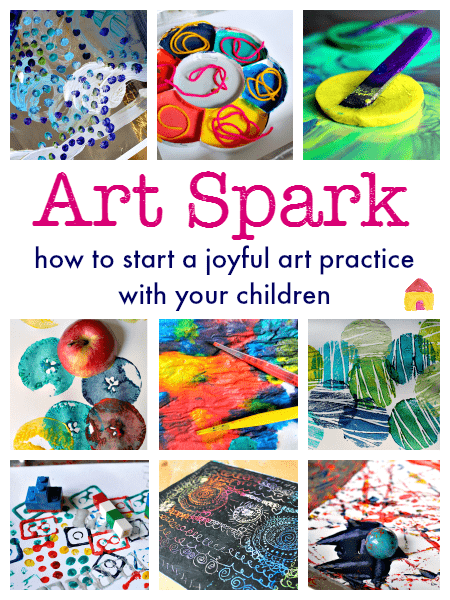 :: as a hand-out to give to the parents of the children you work with, to encourage them to think about trying art at home, using some of these affordable, creative materials. 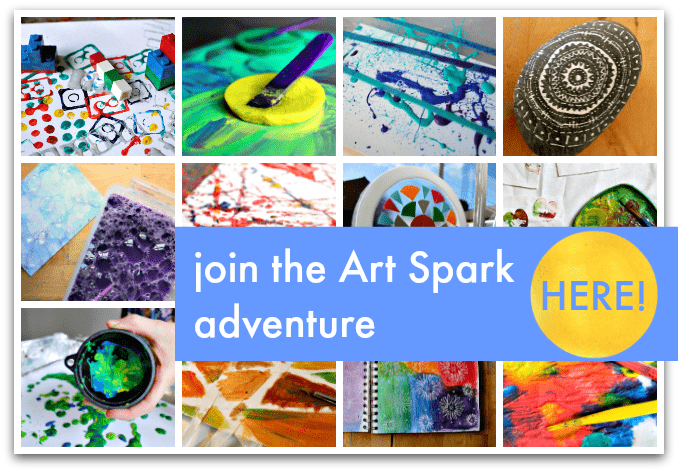 Click through here to download all the Art Spark resources to use with your children. Really helpful though. My kids love painting. I want to provide best art material to my kids. Because i thought it will make my kids creative. To build their creativity, i have to provide some of this art materials lists. Thanks for sharing nice blog.